We do not usually review products that we have never carried, but we came across a BacTrack B70 Breathalyzer by chance, so we just had to give it a whirl. 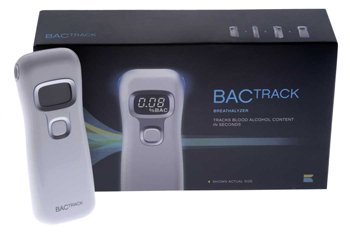 The BACTRACK brand is one of the latest brands of breathalyzers to come out with the slogan; "Sleek. Simple. Accurate.". 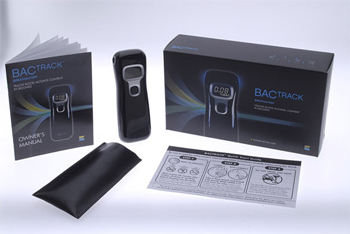 Before even opening the packaging, we already could tell the BacTrack B70 was already one of the sleekest looking breathalyzers on the market. As shown in Figure 1, the B70 comes in one of the nicest packaging we have seen for a breathalyzer. The unit that fell into our laps was a white model, but a black color version is also available. Figure 1: The BacTrack B70 Box. The BacTrack B70 comes equipped with a carrying pouch, operation manual, and quick user guide. The carrying pouch fits exactly one B70 breathalyzer and makes storage in your pocket or purse convenient. To go over it again, the BacTrack has a sleep polished design. Two inlet holes allow the user to blow from either direction. This makes it particularly useful when you want to switch from testing yourself to testing your friend and from left hand to right hand. 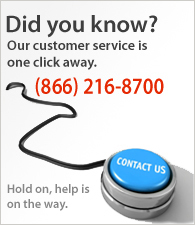 One button operation has become an industry standard for a breathalyzer, and the BacTrack is no different. Turn it on, let it count down, blow, and get your results. So far it's "Sleek" and "Simple". When the unit is powered on, the two inlet holes of the BacTrack light up to a soft blue color. This adds nothing to the device, but it is neat, and we like it. Unlike the AlcAlert BT5500 breathalyzer, though this device uses two AA batteries (not included) so the size is rather large and heavy for a mini breathalyzer to fit in your pocket alongside a cell phone and keys. Sleek, simple, but is it accurate? The BacTrack has a test range of 0.00 ~ 0.40% BAC which puts it on par with the bigger hand held units. 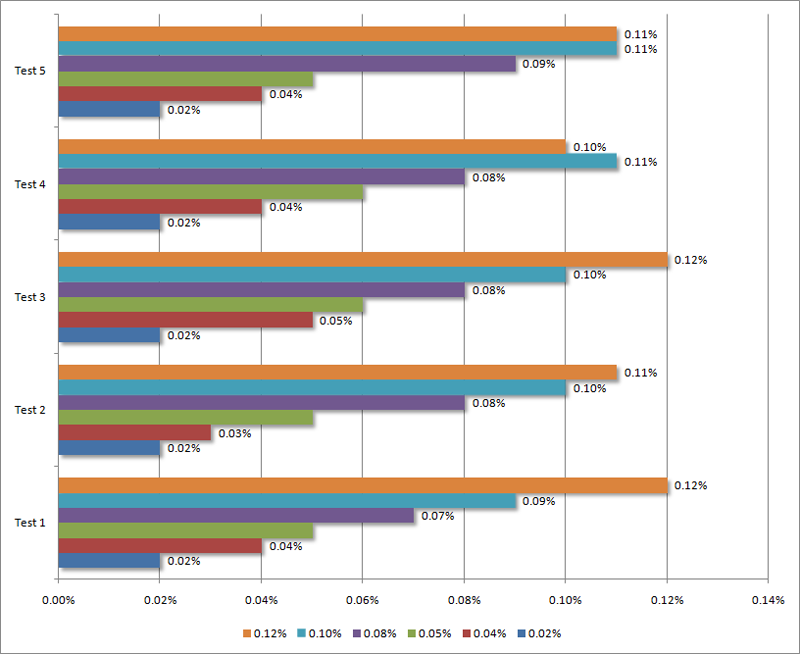 We ran several comparison tests of the BacTrack. We found that it was accurate enough to prevent people from getting behind the wheel or at least discourage it. However, it must have been too sensitive, because just about every other test we took, the unit would fail to give a reading. Maybe the slogan should be changed from "Sleek, Simple, Accurate" to "Sleek, Simple, Sometimes Accurate. 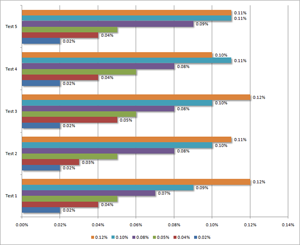 " Just like cars, the first model year of a generation will prove to have many little problems, and breathalyzers are no exception. The BacTrack proves that breathalyzers do not have to be ugly devices that are awkward to carry with you, but can be stylish devices that may promote use. We're confident that the next generation of the BacTrack will improve upon the great design and feature set. However, we cannot recommend this device at this time. At a hefty price tag, there are just too many better breathalyzers that are more accurate and reliable. When you are making the decision to wait around longer before getting behind the wheel of a vehicle, it's important to have that peace of mind. At this price range, there are just too many reasons to go with a more sophisticated breathalyzer instead of paying for a sleek design that does little else but look pretty in your pocket. Inaccurate compared to other devices in this price range.